This the text of the article that appears in the Marine Fish and Reef Annual 2000 published by Fancy Publications. In the past, the generally accepted practice advocated minimal feeding of reef aquariums. This was based primarily on the notion that reefs are very nutrient poor, reef inhabitants especially corals could generate all their energy requirements through photosynthesis and fish could survive by picking off of live rocks. Adding food would only increase the bio load of the tank, increase nutrients and dissolved organic matter. Feeding regimes were oriented towards feeding the top of the food chain - the fish, and the recommended practice was to feed sparingly once every 2-3 days. Food provides the energy necessary for vital functions to sustain life, for growth and reproduction. For an organism to thrive, the total energy demand must be met. Only a small portion (10-20%) of the food energy is converted into useful energy, with most being lost as waste and heat. Thus as we move up the food web, the amount of lower forms of food energy required to sustain the organisms higher in the food chain increases dramatically. In a typical reef aquarium, the complete food web does not exist in quantities large enough to sustain the ecosystem without any additional energy input. We typically provide this in the form of food that we add to the aquarium. However, in the past we have focussed only on feeding the highest members of the food web - namely the fish, leaving the other inhabitants of the reef to derive their energy requirements through other channels in the food web. This model assumes that the rest of the organisms can either derive all their energy through other pathways in the food web, or their demise or reduction in numbers is inconsequential to the proper functioning of a reef aquarium. This model of reef keeping also makes it difficult to keep organisms with specialized feeding needs - sponges, filter feeders, etc. The feeding and nutritional requirements of the organisms in a reef tank is varied and often very little is known about the specific nutritional needs of the organisms. As we strive for greater biodiversity in our reef aquariums, the role of feeding may play an important role. It is often difficult to duplicate the diet of the organisms in the wild, and substitutes have to be found. In fact, it is not even clear how much, how often, should corals and other organisms be fed. This article will present some information on feeding habits of reef organisms (gathered from research articles), along with a discussion on some "new" products that have recently hit the aquarium hobby and may have the potential to increase the range of food available to the entire food web. For the purpose of looking at the feeding requirements of the reef life forms, this article will divide them into several broad categories (based on type and size of food particles ingested), and look at how an aquarist can try to meet their feeding requirements. The broad categories are: Fish, Hermatypic corals (with zooxanthalle), Ahermatypic corals (without zooxanthelle), filter feeders and detrivores. Meeting the feeding requirement of fish is by far the easiest, and there is a wide variety of fish food available ranging from frozen foods to dry foods catering to the needs of the wide variety of fish available in the aquarium trade. The dietary needs of the fish can be easily satisfied by anyone or a combination of these and any fish whose dietary needs cannot be easily met should generally be avoided. So, rather than focus on this I will later just discuss a few "new" food items that have recently shown up in the market and have made it easier to keep certain fish alive and healthy. Corals can be classified into two types. Hermatypic scleractinian corals (primarily SPS corals) use two modes of feeding - Autotrophic and Hetrotrophic. Zooxanthelle are unicellular algae that live within the coral polyp, and are the primary producers that produce food energy via photosynthesis. The autotrophic mode of feeding involves the translocation of the photosynthetic products produced by the symbiotic zooxanthallae to the coral polyp tissues. Research has shown that the total energy demand cannot be met by photosynthesis alone. The corals spend energy for the following functions: respiration, mucus production, growth and reproduction. Respiration accounts for 60-70% of the energy budget of the coral, and for most hermatypic corals the ratio of gross photosynthesis to respiration is slightly greater than one. Hence corals need to provide the additional energy needs via other means. To determine what corals feed on in the wild, researchers evaluate the gut content of corals in the wild and also experiment with the animals in laboratory. Evaluation of the gut contents of a Monastrea coral contained copepods, ostracods, mysids, menatodes, polychaetes and other zooplankton. Suspended organic material ingested by corals via sedimentary filtration included bacteria, protozoans, detritus, feces of fish, etc. Interestingly, research indicates that the scleractinian corals rejected algae and other plant material. Research indicated that even if plant material was ingested it was not digested and regurgitated. The size of prey captured by the polyps can be larger than the polyps, with the general rule being - the smaller the polyps the more important the role of autotrophic feeding. Some of the laboratory experiments were conducted using artemia nauplii as food. These are basically a form of zooplankton. The polyps easily captured nauplii of size 0.7-0.9mm. Corals with larger polyps (e.g pocillopora, stylophora) also captured Artemia nauplii up to 1.4mm. Research in predatory feeding has shown that, even in corals with polyps active in the daytime, polyps hunt more efficiently at night. In ambient conditions on the reef (with wet bio mass of zooplankton ranging from 0.5-4 mg/L, bacteria 1.5-3 X 106 cells/mL, and DOM ranging from 0.5-2 mg of C/L ), as a rough average - scleractinian corals could compose their energy balance as follows: 60-70% via photosynthesis, 10-20% predation, and 10-20% by feeding on DOM and bacterioplankton (Sorokin 1995). The hermatypic soft corals are basically similar in respect to the scleractinians, but there is a wider range on the degree to which autotrophic sources of nutrition are used. Most researchers are of the opinion that octocorals are in general weak predators compared to the scleractinians, and may ingest passively floating particles of detritus, forminifera, eggs of slow moving larvae of inverts, etc. 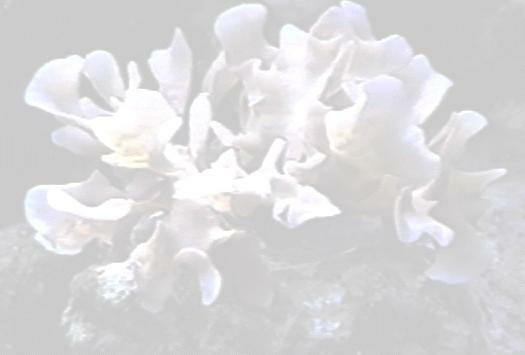 For the purpose of feeding we can further classify the hermatypic corals into small polyped and large polyped corals. The large polyped corals (eg. Euphillia species, cataphylia species, etc.) also typically have large mouths and can be fed small pieces of shrimp and other chunky food (silversides, chopped sea food - fish, shrimp, squid, scallops, etc). Anemones and mushroom anemones (e.g. Rhodactics species) can also be fed in a similar manner. Feeding the small polyped corals is a more challenging task, and one that is more open to debate. Corals from the genus Tubastrea, Dendronepthya, non photosynthetic gorgonians, do not harbor symbiotic zooxanthalle, and hence the autotrophic mode of feeding is non existent in these corals. All the food energy requirements have to be met by hetrotrophic modes of feeding, making these corals more difficult to keep in reef aquaria. Aquariums housing these corals require strong currents and large amounts of planktonic food. Recent research has shown that Dendronepthya and other soft corals from the Red Sea obtain most of their nutrition from phytoplankton (Fabricus et. al 1995). The tubastrea species, is one of the easier ahermatypic corals to keep due to the large polyp size and its ability to accept larger pieces of food. They need to be fed almost daily, and can be "trained" to open at specific times of the day, by feeding consistently at the same time every day. In addition to the fish, corals and other invertebrates, a coral reef aquarium also contains a host of other life forms such as sponges, sea squirts, fan worms, marine worms, copepods and amphipods, etc. Filter feeders typically feed by trapping small particles by processing large volumes of water through their body or appendages. Detrivores feed either on the detritus or ingest bacteria on them, or organics coating the detritus particles. In a well fed aquarium the needs of these organisms may be indirectly met. However, it has been the experience of many aquarists that adding supplemental small particulate food (phytoplankton, blended food mix, rotifers, plankton surrogates, etc) has increased the population and size of sponges, sea squirts, and fan worms. Anecdotal evidence seems to suggest that adding food targeted towards meeting the specific needs of these creatures is beneficial. In the following section, I will discus some of the "new" products that have appeared in the aquarium trade, that will simplify and make it easy to provide nutritional sources of food and attempt to satisfy the feeding requirements of a wide spectrum of the food web. The use of Nori - (also known as Laver, a seaweed of the genus Porphyra, a group of marine red algae) which is used extensively in oriental cuisine has greatly contributed to maintaining the health of herbivorous fish, e.g. tangs. Laver is cultivated as a major food crop in the Orient. Nori (the Japanese term for laver) is sold as dried sheets in various colors from deep brown or red/purple to black-green, in plain dried form, roasted, flavored etc. For use as food in the aquarium, the plain dried form is preferred, although fish will eat the roasted variety - just stay away from the flavored variety. Tangs need to graze continuously, and in most well established reefs there is very little macro algal matter available. The common means of providing this was to use land based leafy vegetables such as lettuce. In my personal experience, I have found most tangs start accepting nori very quickly and I have been able to maintain tangs in full-bodied form (without shrunken stomachs) using nori and other seaweeds. There is a large variety of naturally dried seaweed (kelp, dulse, laver) available in most oriental grocery stores and health food stores, and some of these are excellent food for tangs. A wide variety of seaweeds are also available through the aquarium companies (e.g Julian Sprung's Veggies, Ocean Nutrition's Seaweed Selects). To feed the fish, these sheets of dried algae can be attached to rocks with a rubberband, or attached to a "lettuce" clip. Indo-Pacific Sea Farms (www.ipsf.com) has recently started supplying live natural seaweed (Gracilaria and Ulva species) under the trade name Tang Haven. Several aquarists have reported being able to keep the Gracilaria growing in sufficient quantities in their lighted sump and refugium. It grows fast enough to use as an additional supply of fresh live seaweed for tangs and other herbivorous fish. A few years ago I had trouble keeping the Red Sea Anthias Squammipinnis alive for any significant period of time. The primary difficulty was in getting them to feed. Anthias are planktivores that feed in open waters and require feeding several times a day. The Sweetwater Zooplankton was very readily accepted by the anthias as food, and I was able to wean them on to other foods. Now even my anthias relish nori !. Sweetwater zooplankton consists primarily of cultured daphnia (water fleas). It is available in sealed jars with unlimited shelf life. Once opened, it needs to be stored in a refrigerator and will last for up to a month. Phytoplankton are free floating microscopic plants that grow in the upper regions of the ocean where sunlight is plentiful. These small plants, which are composed of algae, are the bottom of the food chain for the entire ocean, and the largest group of primary producers in the ocean. There are several hundred species of phytoplankton. In a typical reef aquarium, the phytoplankton population is very low to non-existent - either it gets consumed faster than it can reproduce, or gets removed by skimmers. Phytoplankton serves as the primary food source for a lot of reef organisms. Phytoplankton come in a wide range of microscopic sizes. Based on the study on Dendronepthya (Fabricus et al 1995) the range of size suitable for corals is the range 3 to 20 micro meters. Examples of strains of phytoplankton are Nannochloris, Isochrysis, Tetraselmis, among others. Although phytoplankton can be cultured at home, the process is often beyond what an average aquarist wants to get involved with. Recently several products have appeared in the market that have the potential to simplify the process of phytoplankton addition. Inland Seafarm (www.seafarm.com) manufactures a cryo preserved algal paste - under the trade name Instant Algae, in a number of different algal strains. Brineshrimp Direct (www.brineshrimpdirect.com) is a supplier for the cryo preserved micro algae, and currently offers Tetraselmis MC2, Nannochloropsis and Isocrysis species in 4 sizes (12 ml, 100 ml, 500 ml, 1000 ml). The microalgae paste is highly concentrated using a low gravity centrifuge, and a food grade cryopreservative is added to prevent freezing and lysing of the algae cells when kept below freezing temperatures. The paste remains liquid when frozen and can be kept for several months in a refrigerator freezer. Feeding can be easily accomplished by adding a few drops of the paste directly to the tank and letting it disperse in the water currents. I have been using 10-12 drops of the concentrated algae in my reef, every 3-4 days. I turn the skimmer off, for several hours when feeding micro algae, to keep the food from being removed by the skimmer. This is a very easy and convenient way to add phytoplankton to the aquarium, without all the hassles of growing your own cultures. In an article in Aquarium Frontiers, Craig Bingman reported some success in keeping dendronephtya using the cryo preserved algae (http://www.aquariumfrontiers.com/fish/aqfm/1998/april/features/1/default.asp). Another product that has recently become available is DT's Marine Phytoplankton. DT's marine phytoplankton is live and of the Nanochloropsis species of algae. The phytoplankton is specially processed to remove the nutrients used for culture, and sold in a liquid form which can be stored in the refrigerator. The product claims to have a shelf life of upto a month in the refrigerator. This is also easy to add to the aquarium, and provides another easy and convenient method for adding plankton to the aquarium. Another sources for live phytoplankton is Liquidlife (http://sites.netscape.net/liquidlifeusa). In contrast to the cryopreserved phytoplankton, this phytoplankton is live and provides the added benefit of live food - triggering the feeding response. The other benefit of live phytoplankton is that they will be able to swim, remain in suspension longer, and also take in some of the nutrients from the tank. The disadvantage is that the product shelf life is limited and the cost is higher. The best strategy for feeding phytoplankton may be to use a mixture of several different species. Different creatures may have different tastes and may prefer one species over another. Studies using a mix of phytoplankton species have been shown to produce increased growth and survival when compared to animals fed a single species. When feeding with phytoplankton most researchers recommend feeding in doses such that the concentration of phytoplankton is in the 10,000-100,000 cells/ml range. Knowing the concentration in the phytoplankton product one can then determine how much of the product to add. However, most suppliers of live phytoplankton do not provide this information, so I just aim to make the water turn a light shade of green. It usually clears up in an hour or so. Interestingly, research indicates that the scleractinian corals rejected algae and other plant material. Research indicated that even if plant material was ingested it was not digested and regurgitated. This has interesting implications for the hobbyists since it could lead to the conclusion that "green water" or phytoplankton may not be a suitable food for hermatypic scleractinian corals. However, there may be indirect benefits to these corals from the increase in other microfauna resulting from the feeding of the phytoplankton. Several aquarists including myself have observed increase in the polyp extension of corals, and increase in feather dusters, sponge and tunicate populations, along with increases in other micro inhabitant populations. In addition to providing additional food source that can be directly added to the tank, these phytoplantkon products can also be used to enrich artemia, and as a food supply for rotifers. ESV (www.esvco.com) sells a spray dried phytoplankton product, as another solution to addressing the addition of phytoplantkton to reef aquariums in an easy manner. The spray dried phytoplankton is intended for use as food for corals and other invertebrates, fish food, larval fish and invertebrate food, and an enrichment food for Artemia and rotifer culture. The spray dried product has the advantage of being convenient to use, does not require storage in the refrigerator and has a long shelf life. The disadvantages are that spray drying may impact some of the chemicals in the phytoplankton and reduce their nutritional value. There is a large variety of artificial foods designed for the aqua culture of shrimp, clam, oyster and other seafood. These could potentially be used in reef aquaria to feed the filter feeders and even some corals. These feeds are available in sizes ranging from 5 microns to 250 microns. Over the last two years, I have been adding a "pinch" or two of Artificial Plankton and Rotifiers (APR) that is made by OSI and available through Aquatic Eco Systems (www.aquaticeco.com). Aquatic Eco systems also has a wide range of larval feeds intended for clam, osyter, and other aquaculture that may be very well suited for feeding reefs. After using the APR, I started to notice increase in the number of sponges and filter feeders in my tank. Also, the existing sponges increased in size. This was my first foray into attempting to feed the filter feeders, sponges and tunicates. Newly hatched brineshrimp are an excellent food source for a reef aquarium. Additionally decapsulated brineshrimp eggs can be used. I use the decapsulated brineshrimp eggs as an additive in my food mix, and also feed the tank occasionally directly with this. Spirulina algae, is another excellent source of nutrition for marine fish and invertebrates. This can be fed as spirulina food flakes, or in the powdered form to be used in a food mix. Another useful food additive is the Omega-3 fatty acids that are important part of the diet of most marine animals. The omega-3 fatty acids that are of interest are the highly unsaturated fatty acids (HUFA), DHA and EPA. These fatty acids are an essential part of the diet for most marine fish larve. It is often recommended that brineshrimp and rotifers be enriched with omega-3 fatty acids before feeding. There are several products such as SELCO, HUFA enrichment products available from aquaculture supply stores. Aquatic ecosystems (www.aquaticeco.com) is an excellent source. I have been feeding my aquarium more heavily than the average aquarist for the past two years. Rather than try to feed the fish, inverts and filter feeders separately I wanted a concoction that would satisfy most needs with single feedings, supplemented by specific target foods occasionally. Here a recipe that I (and several other hobbyists have used variations of this) have been using. I basically go to the sea food section in the grocery store, and pick up several shrimp, squid, sea scallops, mussel, clams, fish, and any other raw seafood that is available. The other main ingredient I use is Nori. I also use other natural dried sea weeds that I have been able to find in the oriental grocery stores. First throw the nori (and other seaweed) into the blender and shred into small pieces. Do this while its dry and it breaks up into nice small pieces. Then, remove most of it to leave a hand full in the blender and add half the seafood mix along with some water and blend it into a fine liquid paste. Then I add back the rest of the nori, the remaining sea food mix, along with some spirulina flakes, spirulina powder, decapsualted brine shrimp, vitamin drops, a few drops of algal paste, some artificial plankton and rotifers, some yeast and a few drops of Selco. Chop it in the blender so as to give some larger chunkier pieces. Place the mix into the freezer bags and spread it thin in the bag to allow breaking off pieces easily, and freeze. The finely blended stuff along with the other micro sized food will work fine to feed the filter feeders and corals, and the larger pieces along with the nori works well for the fish, and the other invertebrates such as star fish, and shrimp. The exact proportion of each is not really all that important, I just try to make sure that there is enough variety to satisfy the wide range of life forms in the tank. I have recently experimented with adding broccoli, carrots and spinach to the mix. I have seen the tangs eat the pieces of spinach, broccoli, and carrots. Some other ingredients that I have added to the food include fresh fish, brine shrimp, freeze dried plankton, dried blood worms, and other fish food I have laying around. The basic idea was to create a one shot food recipe that will take care of the complete spectrum of life forms in the tanks. I feed about a 2" square piece of this food every day in my 180G tank. I prefer feeding at night before the lights go out, since the coral polys are more active at night. Many reef aquarists have started feeding their tanks more heavily than in the past, and adding food targeted towards the specific needs of the complete food web. There is enough anecdotal evidence to indicate the visible benefits of feeding in these reef aquariums - in the form of greater polyp extention in corals, increased population and size of sponges and filter feeders, increased diversity in the population of the microfauna, and in the general health and appearance of fish and invertebrates. So, should you rush in and start feeding your reef aquarium heavily ? NO !. Increase in feeding should be gradual, providing enough time for your aquarium to adjust to the increase in food. The aquarium will adjust by allowing the exisiting animals to respond to the increase in availability of food by increasing their population. This increase is not going to take place instantly, and occurs over a period of time. Our problem is to balance food input and export/assimilation to keep the level of dissolved nutrient low. A good sand bed fauna and a good skimmer will generally help in keeping the nutrient levels low and allow you to feed at levels that suits the wide diversity of life in the reef aquarium. Sorokin, Y.I. (1995): Coral Reef Ecology, 2nd Edition, Springer Verlag, New York, USA. Fabricius, K. E., A. Genin and Y. Benayahu. 1995. Flow-dependent herbivory and growth in zooxanthellae-free soft corals. Limnol Oceanogr 40(7):1290-1301.